Bacon…so, not so local to where I live now. But I had to stock up on my favorite bacon when I was in Ann Arbor last Thanksgiving. My three biggest passions in life are peacebuilding, health, and the environment. Food is directly linked to all of these things. There are strong local solutions to major global problems, food is one of them. We all need to eat and how we do so impacts the health of ourselves, our communities and our planet. I know that I am in a privileged position that I have lots of options of what I can eat. I don’t have to worry about how I’m going to pay for my food and I have a kitchen where I can prepare my food. I live a mile from a year round farmers’ market and have a Whole Foods, Trader Joe’s and other chain grocery stores, as well as a co-op all within a few minutes. I have transportation to get to those places. I am also single and have decided that paying for quality food is a priority. Having said that, without having actual numbers right here, I don’t think I spend more on food now than before I made local food such a high priority. Eating locally has many known benefits and lots of speculated benefits. Since eating locally as a movement is fairly new, research is still being done to examine the many potential benefits. I know that I feel better when I have control over what I eat. (This is partly due to having dietary restrictions which I may write about another time.) A lot of people have researched the economic, environmental and health benefits of local eating and have come up with differing answers (though this is often to due to differing interpretations of data and not necessarily conflicting data). Keep in mind that local, organic, sustainable and natural are often used interchangeably but they are not all synonymous. I try to eat local, organic foods as much as possible and, as a result, those foods often come from more sustainable foods systems. Taste: fresher food tastes better. When vegetables go from farm to table in a day or two rather than a few weeks, they taste better. Health: my vegetables are organic and I know were they come from. I don’t have to worry as much about outbreaks of bacteria or food-born illnesses when my food doesn’t go through lots of processing centers. Health: my meat and dairy are not full of hormones and antibiotics. While the science isn’t conclusive yet (mostly because these studies are recent and not enough time has passed to study long-term effects), I find it hard to believe that meat full of hormones is not having a harmful effect on us. Health: fresher produce is better for you. Produce that is ripe when it is picked and is eaten soon after is more nutritious. 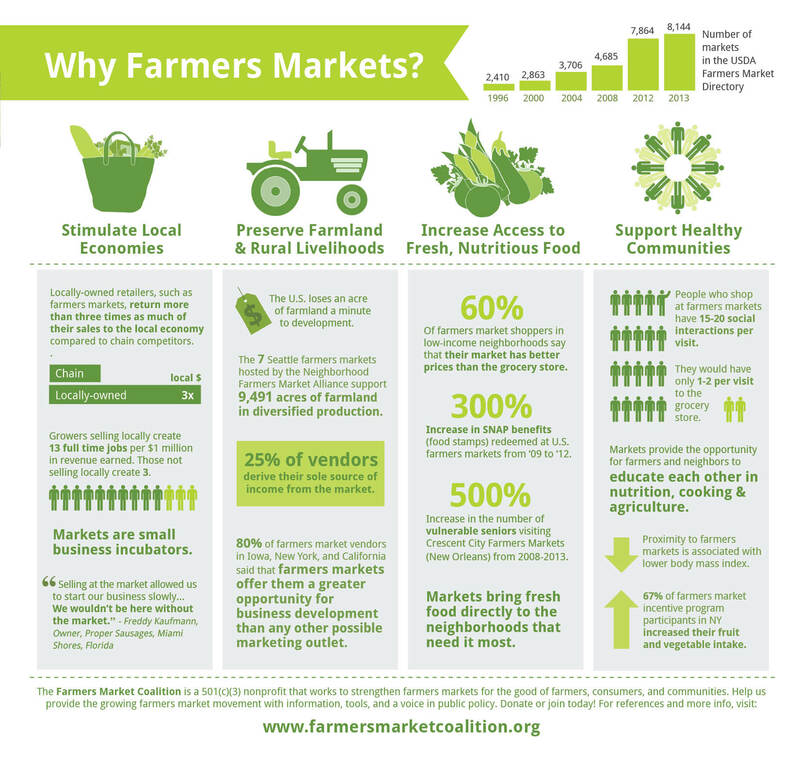 Economy: buying from local farmers supports the local economy. If you spend $5 on cauliflower, then $5 is going to the farmer. Community: people who shop at farmers’ markets are more likely to be involved in other community activities. Farmers’ markets are sometimes used an indicator of healthy communities and high standards of living. Environment: food that travels 50 miles to get to my table is significantly less carbon intensive than food that travels 1500+ miles. Environment: meat that is grown on smaller farms often travels a shorter distance to slaughter and is raised in a more sustainable way, meaning lower emissions. Eating local food isn’t always possible. But, when it is, I choose local. Sometimes it’s February and I want berries and I buy them. Plus, I love avocados and bananas. I’m not an orthodox local eater, I simply choose to buy my food from local vendors as often as I can. I’m also not ignorant to the very real concerns with how to feed billions of people. Not everyone in the world has access to local food, but that can be a post for a different time. The University of Vermont’s ten reasons to eat local. Michigan State’s seven reasons to eat local foods. And info about a great book by Barbara Kingsolver. Local Food: Does It Matter What We Eat?